You've seen them turn up on auction sites from time to time: "authentic vampire-killing kits," attributed to a master craftsman, Professor Ernst Blomberg of Germany. (One sold for $12,000 at Sotheby's.) A British museum curator explains how he proved them to be fakes — and why they're nonetheless still very valuable. 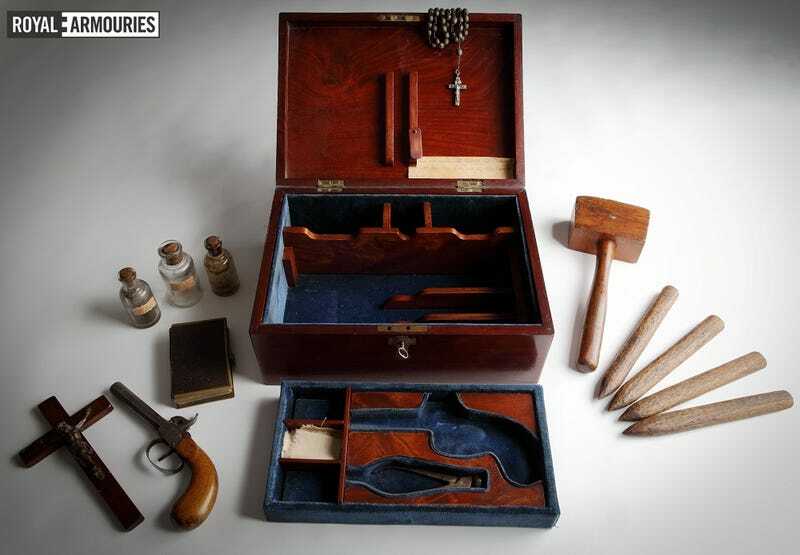 The typical vampire-killing kit, supposedly carried around Europe by a bunch of Van Helsing-wannabes, consisted of a walnut box with a hinged lid, housing such items as a wooden stake and mallet, crucifix, pistol and vials of garlic powder. Over the years, some have said they were authentic; others said they were made as souvenirs for gullible tourists who descended upon Transylvania following the publication of Bram Stoker's Dracula. I suspected that they were indeed novelty items, but were rather more recent than many believed. I conducted a survey of the folklore surrounding 'real' vampires, that is, dead bodies exhumed by a troubled community and ritually 'killed' as scapegoats for whatever malaise might be affecting people. Nowhere was there evidence to support real vampire slayers carting about one of these kits. I persisted, revisiting the fictional stories and movies of my childhood and beyond, noting the development of the various ingredients in the typical vampire killer's toolbox. It became clear that the "Blomberg" kits, with their focus upon silver bullets, were very unlikely to have existed prior to about the 1930s at the earliest. Though constructed from antique boxes and contents, they were most likely not produced until the era of the classic Hammer vampire movies. Other kits are harder to pin down in terms of date and could be older, but there is as yet no evidence of this. To some this might come as a disappointment, or even as a reason to decry the kits as fakes as some do. Would-be buyers should certainly not purchase under the apprehension that they are buying a Victorian antique as my own research has shown. So why acquire such an object regardless? Museums do collect deliberate fakes as comparators and for their own artistic and cultural merit, yet vampire kits are not fakes per se, because there is no evidence of a Victorian original. So, if they're not fake, and not reproductions, what are they? The answer is that they are "hyperreal" or invented artifacts somewhat akin to stage, screen or magician's props. Although I had set out to 'debunk' their very existence, I came to realize that these enigmatic objects transcend questions of authenticity. They are part of the material culture of the gothic; aspects of our shared literary and cinematic passions made physical. Lacking any surviving artifact of vampirism either folkloric or fictional, fans of the gothic had created one to fill the gap. So whilst we at the Armouries still plan to scientifically test our vampire kit, and there is the possibility that it's early rather than late 20th century in date, for me the outcome has almost become moot. Vampire killing kits are genuine artifacts of the Gothic fiction that still provides sustenance to our most beloved monsters.